The properties of healing metals have been known throughout humans’ recorded history. Copper is a common metal used for its healing properties, as it is considered a metal for the grounding of the human body and spirit, but due to the reaction that many people’s skin has to copper, it is not a prime material for body jewelry. Fortunately, there are many other options of both healing metals and stones that can both decorate your body as well as benefit the mind and spirit. Gold is one of the most useful healing metals. A multitude of jewelry is made from gold, but only 24-karat gold is not composed of other metals. Gold, by itself, is thought to clear away negative energy. We do initial piercings with gold jewelry, and it is also a great metal to use when your piercing is fully healed. Silver is another of the healing metals that is most useful. Silver has excellent antimicrobial and antibacterial properties. Throughout history, silver has been used in medicine to cure infections and help heal wounds. This makes it a prime choice for body jewelry. Aside from the medical properties of silver, it is thought to bring calm and balance, as well as reflecting away negativity and evil intentions. Of course, silver is not just a color, and every metal that is silver in color is not made from actual silver, so it is very important to be sure that your jewelry is actually silver. You are most likely to find replacement body jewelry made of sterling silver, as it is not used for initial piercings. Another metal that we pierce with is steel. It is important to look for “implant grade” surgical steel which is often labeled 316L or 316LVM ASTM F-138. Just like with most metals, there are different grades, some of which are okay to wear in your body and others that you want to avoid. The ASTM stands for the American Society of Testing & Materials. They develop and publish standards for metals, and a host of other things. The standards that they have set have also been used in many federal, state, and local laws and regulations. You can learn more about how the numbering for ASTM standards is created here. 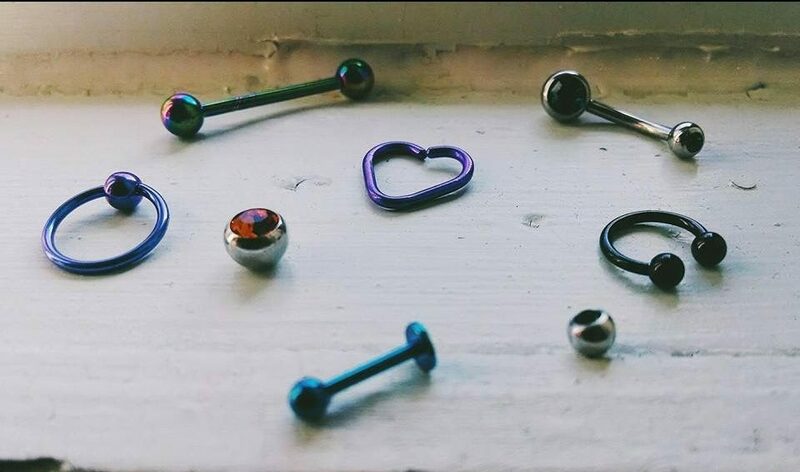 Most of the jewelry that we carry at Almost Famous Body Piercing is titanium. We use it for initial piercing jewelry as well as replacement. If people have sensitive skin or allergies to metals, we always suggest that they be pierced with titanium jewelry. Grade 5 Titanium is an alloy so it contains other elements to be strong but still light weight. However, it also contains very few impurities. So few impurities that titanium is often used in prosthetics and orthopedic or dental implants. 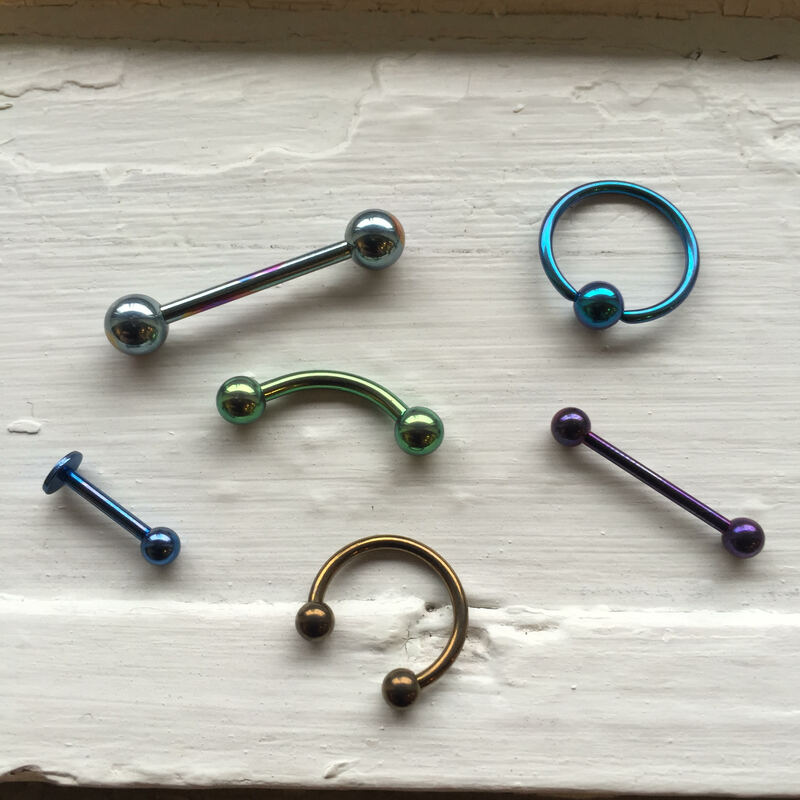 In order to achieve the many different colors of titanium that you’re able to choose from, it is anodized so there are no dyes or brighteners used, keeping it pure for wear. While other metals can have healing properties, metals that are not pure are not optimal for using for their healing properties. Minor changes in the balance of the alloy (the composition of different elements in the metal) can cause a metal to have an effect that wasn’t intended, or significantly lessen the effect of the metal. Body jewelry can also be made of metal or plastic. Jewelry can also be found in a variety of natural stones, making it a great option for applying the healing properties that different stones can have by using body jewelry. The placement of a given metal on or in the body can enhance or alter the effect that the metal has on the wearer. With “traditional” jewelry, on the hands and fingers, wrist, neck, and occasionally ankles, you are severely limited in where the metal can be applied and what effects it can have. People are often more or less sensitive to certain metals in their ear lobes than they are in their lip piercings, for instance. Piercing allows you to place the metal you want in the location you need. No matter what type of body piercing and metal you’re looking for, Almost Famous Body Piercing can help!